Tesla customers who want the full $7,500 federal tax credit have until October 15 to order a Model S, Model X or Model 3 electric vehicle, a new deadline posted on the company’s website that could spark a flurry of sales. The October 15 deadline was added Thursday to the Tesla website. Earlier this year, Tesla hit a bittersweet milestone when it delivered its 200,000th electric vehicle. The achievement — a noteworthy occasion for an automaker that didn’t exist 15 years ago — activated a countdown for the $7,500 federal tax credit offered to consumers who buy new electric vehicles. The tax credit begins to phase out once a manufacturer has sold 200,000 qualifying vehicles in the U.S. Under these rules, Tesla customers have to take delivery of their new Model S, Model X or Model 3 by December 31. 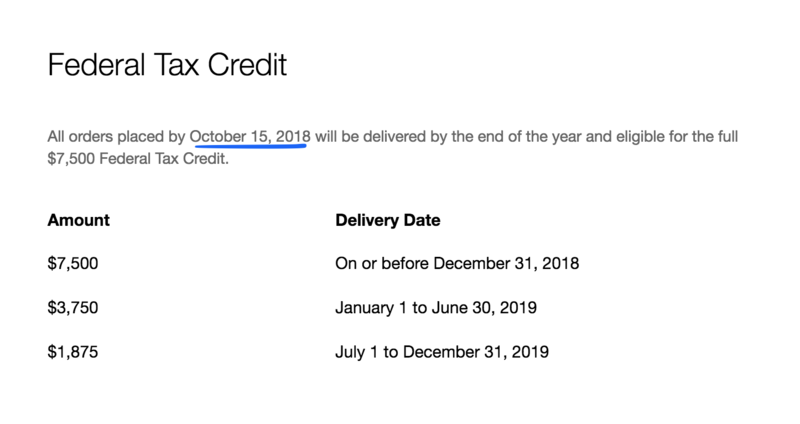 Tesla explained how the tax credit would phase out and the Dec. 31 delivery deadline two months ago. Until Thursday, it wasn’t clear if or when Tesla would impose a deadline for customers to order their electric vehicle. Tesla estimates that customers who order a Model X and Model S right now would take delivery of their vehicles in November. The Model 3, depending on the variant a customer chooses, could take up to eight weeks, according to the company’s website. The newly imposed deadline may spur sales, giving Tesla an added boost to close out 2018. However, these delivery-sensitive sales come with added responsibility — and the potential of angering new customers if Tesla fails to meet that deadline.